Hey friends, this is Neha Chandna and you are watching NC Tv. And today I'm going to talk about a very important part of our body, that is our hair, which is such a close reflection to our personality. Hair and self esteem have such a correlation that people actualy get into depression when they lose their hair quality or texture. Hair industry is a billion dollar one and the market is flooded with shampoos, conditioners, gels, creams and you name it. But yet, after investing into these products also we don't see a noticable change in our hair quality. That's because it's not about the external, it's totally about what is internal. And our body works on a very very basic logic. The nutrients that you get into your body first gets distributed to the vital organs, that's your heart, kidney, liver, lungs etc which are needed for survival. And then the reamaining nutrients get to your hair, nails and skin which are not so neccessary for survival. Or really is it? I'm sure though they are not needed for survival but they are a very important part of our beauty aspect, and anything that goes wrong with that really makes us upset, doesn't it? So, a poor nutrient intake equals to bad hair. So today I'm going to tell you my top my foods which I eat in my day to day life to make sure my hair can sustain all the drama, pollution and stress the poor things have to go through. The first on my list are my greens. Now you can use spinach, coriander, mint, kale, broccoli, whatever you like. Greens are so rich in vitamin A that they keep the cells of your scalp intact and healthy. They are also so rich in iron, and iron is so important for your blood which supplies nutriennts to your hair. So I make sure I add my greens to my juices, my salads or in my food. The next on my list are my mix seeds which I showed you in my Ramaya video and tese are sunflower, pumpkin, chia etc. They are a power house of omega 3 fatty acids which make your hair very supple and soft and unimaginably beautiful. They also have zinc which boosts your hair growth and vitamin E which acts as an antioxidant and safeguards your hair from all the damage. The third on my list is a kiwi and I eat one kiwi everyday because it's so rich in vitamin C and vitamin C is very important for your collagen formation. Collagen is a protein which helps to bind your cells together just like cement binds the bridge together. So of course when your cells are strong, your hairs are strong. Vitamin C also helps to absorb your iron well. The fourth on the list are almonds and we all know how important almonds are for your body. I eat 10-15 almonds everyday because they are very rich in biotin which is a hair vitamin. And they are very richin protein, vitamin, omega 3 , iron and all of these adds super lustre to your hair. And last but not the least is my coconut water. And I make sure to have this 4-5 times a week because it naturally hydrates and moisturises my hair. It adds a lot of lustre because it has potassium, magnesium, manganese and a host of minerals which also strengthens the hair and improves blood circulation. Did you know that coconut water also has cytokines which is a plant hormone which minimises ageing of the cells and amnages your blood PH level. So all in all it just makes your hair beautiful, smooth and shiny. So friends if you want strong, beautiful, lustrous hair make sure you eat natural food as much as possible and avoid applying all the heat and chemicals which ruin your hair. And if you liked this video, as always give it a big thumbs up, share it with your friends, subscribe to my channel and let me know if you want more information about hair in the comments below. Till then stay healthy and positive and love your hair. Greens are such an integral part of weight loss but most of us don’t know how to use them. We kill the enzyme and nutrients and make them completely useless for our body. So if you wanna know how to use greens in a proper way for weight loss. Watch this video. Hey friends. This is neha. Today I am going to be making my very own version of a green smoothie for you. So greens like spinach, kael, parsley, mint are nature’s true healing foods because they are abundant in vitamins and minerals such as vitamin a, vitamin c, iron, magnesium chlorophyll which completely heals the body. They are very low in fat and carbs and very rich in fiber. So they give you a feeling of fullness and satisfaction and they make you feel totally alive, thanks to the enzyme in them. But the best way to consume them is raw in the form of a smoothie. Very simple yet very effective. Which will help you to cut those extra pounds which you are carrying in yourselves. So, to begin with first, adding my mint leaves to the jar, a handful of basil leaves, a few spinach leaves like 5- 6. If they are baby spinach, you can add even more. Then I am going be adding betel leaves so now this one is really big so add half of it. Betel leaves is extremely rich in vitamins and minerals and it has lot of good properties, for the body like it helps to relief constipation, it has properties to heal your body to help the leaves and bloods better. So this I am going to be adding this to my juice. And then I am going to adding some pineapples. Pineapple are very rich in vitamin C so they help in to absorb the iron very well so irons are also very rich in bromaline, which is an enzyme which helps to digest your food better so pineapple will go into this and this will blend really well with all the greens. And then I am going to adding half a cup of water to help it to blend well so, now my juice is or smoothie is ready, I am not going to straining this because I want to keep all the fibers intact to keep me full. This smells so fresh and live. Start you day with this lively green juice or replace any of your heavy mid meals with this and you are good to go. You can also carry this to your work and anywhere that you are going out and put this in a mason jar like this. So there is no reason that you cannot have your greens smoothie and trust me this is so filling that it is really going to help you in weight loss. So, friends if you like this video you should try this recipe at home, don’t forget to give it a big thumbs up. Share it with all your friends and let me know how you make your green smoothie in the comments below and subscribe to my channel. Till then, stay healthy. Stay fresh. Are you constantly thinking about how to get strong bones? Then this video is for you. Hey this is Neha and you are watching NC Tv. Just a few days back I uploaded a video in which I said I gave up dairy and I actually told you about the side effects that dairy has on our body and I was flooded with one question, and that was- Neha where do we get our calcium from to build strong bones? So people I decided to make this video to make sure you get your calcium myth sorted and your bones remain strong for the entire lifetime. So the point is that dairy and dairy products are really acidic for the body and they are not digested by the system. Now the whole point of getting calcium in the bones is by letting the calcium being absorbed by the system. Now when milk and milk products are not even digested by the system because we generally lack the enzyme lactase to digest milk and milk products how will you get the calcium that is there in the milk? So there is no digestion and definitely no absorption of calcium happening. The dairy industry has done a fantastic job in promoting milk as the sole food rich in calcium for strong bones, but the fact is that every food that you eat has calcium in it, be it your vegetables, fruits, nuts, grains, all these fruits have good amount of calcium which are readily absorbed. Also calcium is not just the only mineral needed for strong bones. To help calcium get into bones and build into strong bone mass you need magnesium, potassium, phosphorous, silica, vitamin C, proteins and a lot of other nutrients to make sure that your bones form nice and strong. But people are still fretting about calcium and they wanna eat calcium rich foods to make sure that they don't lose their bones. So today I'm going to tell you about my top 5 foods which if you intake in your daily diet you don't need to worry about your calcium intake. So the first on my list are the greens. Green leafy vegetables like parseley, mint, coriander, kale are super rich in calcium. I wouldn't consider spinach as a part of this because calcium in spinach is bound with oxalate which doesn't gets absorbed in the body very well. All your other greens are a great source of calcium. Not only calcium but they also have magnesium, potassium which I said are so important for bone formation. One glass of green smoothie a day can easily replace your one glass of milk and you don't need to worry about your calcium intake. The second food on my list area seasame seeds, white seasame seed and these are such cute little tiny seeds which are so abundant in calcium. All you need to do is roast them, grind them coursely if you want to make sure you need the best of the nutrients that are inside the seeds because the outer covering is really hard so it might not get digested in your body but when you coursely grind it you make sure that you get all the calcium that is there inside and just make a paste, add it to your salad, to your soups or to yor dal, or just coursely grind the powder and top your salads or porridge with this tiny cute seeds. Next on my list is ragi. Now this is a very common millet and we Indians are blessed with so many millets that we don't even know of and ragi is actually a poor man's source of calcium because it's so cheap, readily available in India and they are so rich in calcium. So you can actually just have a porridge of this or the roti of ragi is really healthy and I've come up with my own ragi khakras with seasame seeds so they are again a great source of calcium. You can add ragi as a part of your daily diet as lunch or dinner and you are sorted with your calcium. The fourth ones are dried figs, and these are my personal favourites. I love them, so rich in iron, so rich in energy and so rich in calcium. Not only calcium but even magnesium and potassium. So they form perfect food and perfect ingredient for strong bones. So two or three a day and you are great to go. They are great snacks, you can carry them in your bag and up your energy and up your bone mass. The fifth on my list is amarauth seeds. Now these are really ancients millets again in India and they can be had as khichdi, porridge, upma, you can roast them or powder them and add them to your laddoos or whatever form you want to. You can even puff them and eat them as popcorn or add it to your porridge. They are again very rich in calcium, magnesium and phosphorous. So these were my top five foods which I feel if you consume in your day to day life you really don't need to worry about your calcium. But again as I said it's not only about the amount of calcium you eat but also the amount of bone loss or calcium loss that you prevent. So how do you do that? First reduce your salt and sugar intake, because these are really acidic foods and they leech calcium out of your body. Again caffeine in the form of tea or coffee, they make sure that you lose calcium from your bones and osteoporosis is the near future for you. Third, animal proteins are excessively acidic for the body and they again leech calcium from your body when taken in very high amounts. And you need to get yourself moving. If you wanna preserve the calcium in your bones, get moving. Because when you move your body builds stronger and tougher bones. And lastly don't forget my vitamin D which I say in all my videos. Get enough of the sunshine and then you don't need to fret about your bones, no osteporosis, no arthritis. So I hope all your myths regarding bones, calcium, bone loss is clear. But if you still have any doubts, myths, or suggestions you can put it on the comments below. Don't forget to give it a big thumbs up, share it with all your friends and family whom you think this video will help and of course don't forget to subscribe to my channel if you want the videos directly in your inbox. And as I always say don't forget to be healthy, beautiful and strong. Hey Friends, this is Dr. Chandana Ranglani and I am practising dietitian and nutrition educator in Khar Mumbai since 8 years and today I'm going to talk about good bone health. Bones are the pillars of a body because of which we can't stand,move, dance, sit, handle all the daily activities that we do. So it is very important to each, correct and to give the fuel. Your bones need to grow and regenerate. It break, repair and recover just like your other cells in the body and you all know calcium is the most important nutrient for bone formation, bone development and if you want to have your bones to be strong and healthy. There is certain things gives you a good amount of calcium in your daily diet like cereals Ragi jowar etc. which you can easily have. Wheat roti with ragi which is good amount of calcium, then you have your nuts and seeds which again a very rich in calcium like almonds, walnuts, cashews sunflower seeds, pumpkin seeds. So why don't you put a mix diet and a handful of nuts in a day which can give a good use of calcium. Then you have pulse and sprouts which again add to your calcium intake. So you can add them as you can have them as veggies or any way you like to eat them. Green leafy vegetables have again full of calcium like spinach, kale, lettuce and also other greens which you can either have an alligator soup or Juice them or just make a vegetable out of it. Fish also is a great source of calcium, specially for non vegetarians. The two to three times a week if you want to eat fish, you can usually get a good amount of calcium in your weekly dose. Now that is it. Foods which can affect your calcium absorption or can make your own very weak like caffeine tea coffee have a high modest caffeine in and they can actually leach calcium from your bones. So make sure you don't have a excess of tea or coffee in your day. Second is annual proteins like excess of chicken, meat etc are acidic for the body. So that neutralize the blood Ph. The body releases, calcium from the bones that makes your bones weak. Third is soft drinks like a cola and all Aerated drinks. These drink have lot of Phosphate now, except phosphate in blood has to be balanced by calcium which again to body releases from your bones and this makes your bones very weak and the Fourth is alcohol. Alcohol affects your calcium absorption and causes are very big difference in your calcium balance in the body. So make sure you cut down these all foods in your diet, so that your bone health remains intact and you don't have too much a bone loss. Vitamin D- which generally you get from sunlight in the morning between eight a.m. to 11am. So make sure you soak up some Sun because vitamin D is very important to absorb your calcium. Lot of people pop in calcium pills or supplements and still don't have stronger bone just because probably the vitamin D levels are low. So you make sure you have strong bones you need to have good amount of vitamin D levels which you very well and you really get from sunlight. So soak up some Sun in the morning to have strong and healthy bones. Magnesium- It is very important to absorb and retain your Calcium into your bones and you can easily get that from a daily dose of nuts, seeds, legumes, sprouts, whole grains and vegetables. So these little three nutrients which we spoke about it are very important for good bones health and development, but there's also very one important lifestyle change that you need to make if you want to have strong and healthy bones and that is exercise. Research studies show that people who exercise like weight bearing exercises such as weight lifting resistance training at least three times a week they have stronger bones and lesser risk of fractures and osteoporosis than other people because when you exercise the body pushes more calcium from blood into your bones and helps in more bone development and formation rather than degeneration. That is why exercise is very, very important to have strong and healthy bones and to make sure that your risk of fractures are minimum, so these are the few lifestyle steps that I want you to take care if you want to have strong healthy bone. For more information you can contact me through lybrate.com, ask me a query and get them answered. Thank you. Hi friends! This is Neha Chandna Ranglani, a dietitian and nutrition educator practicing in Khar Mumbai since eight years. Today I am going to talk about post pregnancy weight loss and I am sure this is the most important thing for a new mother. Being a mother itself is an overwhelming feeling and there can be no more joyous feeling than giving birth to a new life on earth. But due to so much of physical emotional and mental changes that a mother goes through there is one question which always keeps popping in her mind and that is, "how am I going to get back to my pre pregnancy body?". We need to keep one thing in mind that this is a very crucial period for you and your baby, you have not put on that weight overnight so you cannot lose it overnight. It’s a process and you have to follow a proper procedure to do that and you atleast need to give yourself a six week time to get used to the new routine before stepping into the whole new weight loss program or doing anything drastic that can help you to lose weight. The best way to lose weight is at the rate of half a kg per week. So let’s see how you can lose this weight slowly and gradually without affecting your health too much and here are the following ways with which you can do that. 1. Breast feeding- So it is very important to breastfeed your child, not only to lose weight but also to form a very good emotional bonding with the new baby and breastfeeding is the best exercise to burn away calories and all the extra fat that you have put on so make sure you don't stop breastfeeding till at least one year and keep feeding your baby so that you lose and burn all the extra calories that you have accumulated during your pregnancy. 2. To eat eat eat- Yes it is very important for you to eat properly and not starve yourself. Now mothers kind of starve after pregnancy thinking that they will lose weight with starving because they are so scared of putting on more weight, but let me tell you that when you starve you actually lose your muscle mass and lots of muscle mass can reduce your metabolism which can again lead to weight gain, so please don’t starve. Starving can also make you more hungry towards your next meal and you tend to eat more in your next meal and all the excess food will then go and stored as fat so the best idea is to eat and not to yourself. So now what you are supposed to eat? You need to start your day with a good breakfast which is going to boost up your metabolism. Especially with fruits. Fruits are awesome, they are filled with natural sugars and they fill up your liver glycogen stores so you have the energy to take care of your baby and deal with all the new things that you have to do. So make sure you include a lot of fruits in your diet. Then the next thing you need to include is good fats which come from coconut oil, nuts, coconuts, and seeds. So these are the good fats which have a lot of Omega-3 Vitamin E in them and you find, which help you to deal with all the trauma that your body has gone through, recover your hormones back and aid in weight loss. Now Omega 3 is again very important for your child’s brain development so you need to make sure you include a lot of Omega 3 rich fruits in your diet so that your baby becomes smart and intelligent. Then you need to include a lot of fiber rich foods in your diet which includes salads, green leafy vegetables and whole grains like oats, brown rice, ragi, jowar. All these things are so rich in fiber that they keep you full for a longer time and you actually don’t get your hands on all the crap lying around you, so you need to make sure that your fiber intake is high, fiber also helps you to clear your bowels well which is a very important thing especially post pregnancy when women are facing constipation, fiber is the key ingredient for you to clean your stomach and you get your system rolling well. And it also helps you to keep your sugar level in control, so you don't feel hungry at odd hours and there are lesser chances of diabetes, so you need to make sure you up your fiber intake. Then you need to include good protein food sources in your diet like eggs, nut milks, nuts, seeds, and you can also add some steamed sprouts or pulses which you can digest easily like Moong Dal or Masoor Dal which are easy on the stomach and do not give you gas or bloating because protein is again very important for the wear and tear and all the trauma that your body has gone through to help you repair all of that, so make sure you add your protein sources in your diet. Next is add some galactagogue in your diet, which means foods which help you to increase your milk production, like Jeera, Saunf, Methi seeds, alfalfa seeds. Now as your milk production increases you also lose weight indirectly. So these foods will help you to feed your baby better and lose weight faster. Make sure you do not have very high salty or sugary foods because they can cause a lot of water retention and fat accumulation in your body. Make sure you remove all the high salty or sugary foods from your diet because they can cause a lot of water retention and fat accumulation in your body. Keep your processed food intake minimal, that is food which come in packs, tins or cans, just avoid them or omit them completely because they have a lot of artificial preservatives which can get into the milk and to your baby which we don’t want. So keep all these things out and focus more on live and natural foods because they are easy to digest and they give you the maximum nourishment. Last but not the least, since you are feeding your baby there is a lot of dehydration that can happen so you need to keep drinking water continuously and make sure you are hydrating yourself well. So every half an hour drink 100 to 150 to 200 ml water depending on your thirst, keep sipping water regularly and don't miss out on drinking water to keep you hydrated and to keep your metabolism going on and help you in losing more fat. 3. You need to get active- So exercise and ideal diet go hand in hand to help you shed all the extra weight. So you can start exercising six weeks after normal delivery and eight weeks after cesarean delivery. 10 to 20 minutes of any activity that you like, like walking, jogging, swimming, body conditioning. And do something under a trainer's supervision and then slowly and gradually increase it to 30 to 45 minutes and then to an hour a day. Now this can really help you lose your post pregnancy depression and improve your blood circulation and metabolism which will definitely help you to lose that extra weight lying around you. 4. Make sure you keep your stress level under control- Now this can be quite difficult because with all the new routine and all the new chores that you have to do with your baby it might be quite intimidating for you to get adjusted to the new surroundings and to the new life that you have to take care of. It could be quite stressful, depressing, sometimes it could be quite overwhelming, but you need to make sure you don’t let the stress get better and get over and above your mental state, because when you are more stressful the body starts storing more fat than losing fat. So you need to find out ways where you can control your stress, that could be through breathing, so do 10 to 20 minutes of some yoga or breathing exercises every day. Think positive. Yeah it is very important to control your thoughts. Negative thoughts are very easy to ponder on but it's very difficult to think positive and to maintain that. So make it as an exercise to keep thinking positive and to love yourself, because what a new mother does is only take care of her baby and forgets herself. You need to love yourself, take care of yourself as well so that the body really feels happy raises happy hormones and helps you to lose that weight. For more information you can contact me through Lybrate.com and I can answer all your questions and whatever queries you have you can drop in there in my profile. Thank you. Thank you for visiting my profile. I call my self somebody who lifts you LQ.. that is you lifestyle quotient.., an overall wholistic approch to make sure you mind, body and spirit is on the right path. Its more about making it a daily norm and something that you body tells you rather than you making efforts to get you health in place.. its more of intuitive living.. I believe in health care that is based on a personal commitment to meet patient needs with compassion and care. Dt. Neha Chandna is a dietitian and nutritionist with an experience of over 8 years. She completed her B.Sc in Dietitics and Nutrition from Shreemati Nathibai Damodar Thackersey Women?s University, Mumbai in 2008 and Masters in Dietetics and Food Service Management from Indira Gandhi National Open University in 2011. She has also done a Reebok Instructor Course in 2008. Dt. Neha Chandna is a professional member of the Indian Dietetic Association. She was the university topper in dietetics in 2008 and has received awards such as Miss SVT in 2008 and Miss Duruelo in 2005. She has previously worked as a nutritionist at Waston?s Fitness from 2009 to 2010 and at Leena Mogers Fitness. Dt. 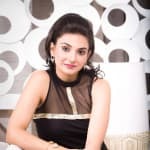 Neha Chandna has devoted her life to increase consciousness among her patients by providing proper dietary advices and to enhance their performance. She specializes with patients facing weight issues and those who wish to improve their health in through the food they consume. She is currently associated with Neha Chandna (Ranglani)- The Nutrition Counselor in Khar, Mumbai. In her clinic, within a calm and supportive environment you can avail a wide variety of services that includes nutrition assessment service, allergy test, child nutrition and treatment of food infection among others. So, in order to lead a healthy life by getting effective remedy to your nutrition or weight related disorders, it is recommended to avail the service of Dr. Neha Chanda ( Ranglani). ? It was getting very difficult for me to cope us with my health problems because of my eatings habits. DR.Neha Chandna(Ranglani) is not just friendly, but also is very motivating. I am so much benefitted with herdiet chart, that i am perfectly fine now. During the treatment, Dr.Neha Chandna (Ranglani) supported me a lot. In order to diagnose my problem completely she asked me a number of questions. Our family physician personally recommended therNeha Chandna (Ranglani). With the help of herdiet Planning I am feeling so great. In the very first sitting, she clearly told us the problem and the what the treatment procedure will be in future. The friendliness of staff is the best in the The Nutrition Counselor clinic . She is one of the best nutritionist in city. She is not just friendly, but also is very motivating. my Gain weight treatment is amazing with Dt. Neha Chandna(Ranglani) at Nutrition Counselor. I was amazed that other doctors before him were not able to treat my problem, but she did it immediately and started the gain weight treatment for it. I'am almost on the path to being fit, Thanks to her perfect advice. I was suffering from obesity due to which I was quite worried. I consulted Dr Neha. she is one of the best Dietician in city. Thanks to her I am totally satisfied with the results of my slimming treatment. Many people gave very positive feedback for her.I also had a great experience with her and the overall treatment she provided, benefitted me to great extent. Not only she is very calm and composed, but is also a very understanding doctor. Even though the problem was not so big, but still the other doctors were not able to treat it. The I consulted Neha Chandna (Ranglani). she gave me diet to increase height. she with great ease handled mycase with ease. I was suffering from weakness from quite long for which I chose to consult Dr Neha. She is a well knwon dietician in New Delhi. The diet chart she gave was perfect for me. Now its been more than a month and I am perfectly fine now. Thanks to Dr Neha for the best diet chart. I was having vitamin D and vitamin B12 deficiency due to which I was facing some problems like hairfall. But Dr Neha helped me alot to overcome with this problem. It was a great experience..overall i will recommend her to whoever wants to take the diet advice..
Menses - Foods You Should & Should Not Eat! You're well acquainted with what happens when your period hits: your stomach spasms, your desires go into overdrive, and eating healthy appears like a noteworthy trial of resolve. A good week pretty much goes into binge-eating out of our bed and watching movies that will make us cry at the drop of a pin. All the dieting and work-out we have been at for the coming bikini months go in vain. And when you realise that, your mood sinks further and the only thing that you presume may get you out of that is another tub of chocolate ice-cream. Complex carbohydrates:Carbohydrates present in fruits, veggies and whole food are the most nutritious types of foods. And nutritious is what you need during your periods. Also the fruits may present you with the sugar that is required to satiate the sugar cravings that you have during your periods. Dark chocolate indulgence: Dark chocolates are a key source of antioxidants and serotonin that can help to elevate your mood. So go ahead and grab that bar of chocolate and dig in. Drink lots of water: It will help to relieve the bloated feeling as your body will be able to release the excess fluids it is holding onto. Caffeine: Caffeine will give you a bloated feeling and can be harsh on the stomach by increasing its acidity and irritability. The constant irritating cramping is enough to keep you occupied, you do not need more of it. Salt: Excess consumption of salt can cause water retention and result in bloating. Your pants get tight enough during this time of the month’; you don’t need to go under further depression. So pass up on the processed foods and the takeaways from your favourite Chinese restaurants. As the mercury levels soar higher, it is time to get creative to keep yourself cool this summer. To keep yourself hydrated and active, you can include fresh seasonal fruits in your daily diet. 1. Melons - Watermelon has high water content that helps you to stay hydrated and refreshed during summer. Melons contain lycopene that helps in protecting the skin against sun damage. Muskmelon is another healthy summer fruit that helps to improve the body's immunity as it is rich in potassium, zinc, vitamin A and vitamin C.
2. Oranges - A juicy orange is a perfect thirst quencher in the summer season. Orange is rich in all varieties of vitamins except vitamin K. Oranges contain a large amount of vitamin C, folate, and thiamin that provide natural protection against the harmful UV rays, help in increasing the production of red blood cells in your body and also reduce stress level. They also help in curing muscle pains and cramps. Beta-carotene, lutein, and cryptoxanthin are present in oranges that help to keep away infections and cancer and also protect the eye from macular degeneration. 3. Mango - Rightly called the king of fruits, mango is loaded with high amounts of selenium, iron, and fiber. It is also an outstanding source of vitamins C, vitamin A and minerals like phosphorus, calcium, and potassium. The cholesterol levels in the body are lowered by high levels of vitamin C, fiber, and pectin. The potassium content of the fruit helps in controlling high blood pressure and heart rate. The fruit also has properties that help in boosting your immunity. 4. Papaya - Papaya is rich in vitamin A, vitamin C, folate, and phytochemicals. These have anti-cancerous, anti-bacterial and anti-stress properties. Papain is an enzyme found in this fruit, which helps in curing ingestion and other diseases of the gastrointestinal tract. The antioxidants present in papaya help in slowing down the ageing process in women, provide a fresh glow to the skin and help in weight loss. 5. Grapes - Grapes help in losing weight by reducing the capacity of the cells to store more fat. Grapes also help in protecting the body against the damaging effects of radiation, cleansing your blood, preventing degenerative nerve disease and boosting cardiovascular health. Most people experience prominent side effects on their body and mind the morning following a night of heavy drinking. These after-effects of consuming excessive alcohol, popularly called a hangover, include rapid heartbeat, headache, anxiety, exhaustion, vomiting, dizziness, lack of energy, and body pain. Drinking too much alcohol (5 to 7 drinks for men and 3 to 5 for women) not only causes a hangover but also can negatively impact your health by damaging your liver, central nervous system, brain and gastrointestinal system. It takes about 8 to 24 hours to cure a hangover completely, but you can try these natural remedies to get quick relief from the symptoms and reduce the recovery time. A hangover is often associated with decreased potassium levels in your body and having a banana will help replenish it as it contains an adequate amount of the mineral. Directions: you can either have one or two whole bananas or a banana smoothie with few drops of honey to get relieve from most hangover symptoms. Honey contains fructose, which helps to neutralize the negative impact of alcohol on your body. Moreover, honey provides relief from the hangover as it also helps digest the alcohol better. Directions: take 3-4 teaspoons of honey after each hour (post-hangover) till you feel yourself getting better. You can increase the dosage according to the severity of your hangover. Tomato juice proves to be very effective in curbing the symptoms of a hangover as it compensates for the dehydration caused in your body due to excessive alcohol consumption. Also, due to its fructose content, tomato helps in metabolizing the alcohol present in your body. Directions: drink a glass of fresh tomato juice or soup laden with 1 tablespoon each of honey and fresh lemon juice. You can have this juice in the morning once and repeat in the afternoon if needed. When it comes to beating a hangover, there is no substitute for water. Drinking water is not only a tried and tested remedy, but is also the most effective way to cure a hangover. This happens because water fights the dehydration of fluids in your body caused by drinking alcohol. Directions: to keep the hangover at bay, drink one glass of water after each glass or shot of alcohol you consume. If you forget to do this, starting your day with a bottle of water the next morning will help reduce hangover symptoms drastically. If you wish to discuss about any specific problem, you can consult a Dietitian/Nutritionist. Here Are Best Meatless Protein Sources! The most common dietary problem that every vegetarian comes across is protein deficiency. It was a widely acknowledged fact that animal products are the best protein sources. However, it is no longer so, and vegetarians everywhere can now rejoice! Green peas: Green peas are legumes, which are a very good protein source. They contain 7.9 grams of protein per serving. Quinoa: Grains usually contain very little protein, but quinoa is unique. It contains 8 grams of protein per serving; and contains all nine important amino acids that your body needs for repair and growth. Nuts and nut butter: Nuts are a good source of proteins and healthy fats. However, eat them with caution, as they do contain 160 calories per serving. Butter made from nuts like peanut butter and almond butter is also a good source of protein. Beans: Beans are available in a variety of colours and shapes, but all of them have one thing in common that is the high level of protein. Chickpeas: Chickpeas are also from the legume family, so they also contain high amounts of protein; 7.3 grams of protein in only half of a serving. Tofu and tempeh: Tempeh and tofu are both soy products and they have the highest amount of vegetarian proteins, about 15-20 grams per serving. Edamame: Edamame or soybean is excellent for snacking. They contain 8.4 grams of protein in just half a cup. Leafy greens: Vegetables usually do not contain much protein, but eating green vegetables will significantly add to your protein consumption. For example, you can eat one cup of cooked broccoli as that contains 8.1 grams of protein. Hemp: Blend hemp seeds in smoothies or baked goods to get your daily dose of protein. Hemp contains 10 grams of protein per tablespoon. Chia seeds: Chia seeds contain 4.7 grams of protein per two tablespoons, making them excellent sources of protein. Non-dairy milk: Milk made from soy (best non-dairy protein source), almond, rice and hemp are good dairy substitutes. If you wish to discuss about any specific problem, you can consult a Dietitian/Nutritionist. Improve Your Quality Of Life With Regular Yoga Practice And Good Nutrition!! Yoga is not simply a set of exercises but a lifestyle. When practicing yoga, asanas and nutrition go hand in hand to improve your quality of life. Your digestive system, immunity and energy levels are directly linked to the food you intake. If there is a problem with any of these, yoga asanas can help resolve it. Digestion: Not all food is easy to digest. Instead of popping laxatives and antacids after every meal, change the food you're eating. Citrus fruits and leafy vegetables that are rich in fiber aid digestion and prevent constipation. Some foods like yogurt, bananas and garlic are probiotics that support the growth of gut bacteria and keep your stomach healthy. Also include carminatives or foods that prevent the formation of gas like cumin, ginger and oatmeal. Yogic asanas such as the spinal twist, Apanasana and Paschimottanasana can help smoothen the digestive process. Immunity: Eating the right food can help boost your immunity. Citrus fruits are rich sources of vitamin C that directly strengthen the immune system. Herbs like turmeric, ginger and garlic are rich in antioxidants and linked to the prevention of a number of diseases including several types of cancer. Proteins also help nourish your immune system and hence should not be ignored. A combination of asanas and yogic breathing techniques can help boost your immunity. Some asanas to try include Viparita Karani, Bhujangasana, Matsyasana and Adho Mukha Svanasana. These poses help lower stress and boost immunity by pumping rich oxygenated blood to all the parts of the body. Energy: The food you eat is turned into glucose to fuel the body and maintain a constant supply of energy. Soy and green leafy vegetables that are rich in iron can effectively boost your energy levels. Fruits like apples, bananas and oranges can also help increase your energy. Yogurt rich in magnesium does not directly contribute towards the creation of glucose but helps the body release this energy whenever needed. Yoga asanas help increase blood flow and increase the heart's capacity to pump blood through the body. A few yoga poses that can boost energy are the camel pose, tree pose and warrior asana. Relaxation: Sipping on a cup of green tea is a good way to end the day and relax. Other food like honey, milk, celery and oatmeal can also help calm the body and fight off the day's stress. Apart from being delicious, dark chocolate also releases hormones that ease stress and help relax a person. Practising yoga breathing techniques like pranayama can effectively release tension. Supta Baddha Konasana, Viparita Karani and the Supta Matsyendrasana can also help increase energy levels.In case you have a concern or query you can always consult an expert & get answers to your questions! A detox diet is a temporary food habit, which involves detoxifying your body without causing much stress. Detoxifying includes cleansing your body of toxins, bacteria, and viruses that build up inside it. It usually lasts for a few days, and a detox diet consists of foods that are easy to digest and low in fat and protein. These foods help liver function and increase your metabolism, which brings about the detoxification progress. 1) Drinking copious amounts of water - Water performs many bodily functions like regulating body temperature, hydrating the body, regulating bowel movements etc. One such vital function is flushing out toxins. The more water you drink, the more toxins get flushed out of your body. Drinking eight glasses of water each day is advisable. Plus, water also helps to control hunger. 2) Munch on fruits and vegetables - Replacing your daily diet with plenty of fruits and vegetables, which are rich in fiber, can help remove toxins. It also provides the body with necessary nutrients and antioxidants. Fruits rich in fiber are spinach, broccoli, avocado, blueberries, beans, artichoke and many others. 3) Eating oranges, lemons or limes - Citric acid helps to dissolve toxins within the body and increases and improves the functioning of the liver. Lemons contain the highest amounts of citric acid and eating them on a daily basis can be highly beneficial. 4) Drinking herbal tea - Herbal tea, which is a huge source of antioxidants and water, helps to flush toxins out of the body. Green tea is a good example of this and is loaded with anti-inflammatory properties as well. In case you have a concern or query you can always consult an expert & get answers to your questions! Weight Loss During Pregnancy - 5 Tips You Must Follow! Being overweight doesn't stop you from getting pregnant but if not managed properly, the excess kilos can have quite a few side effects. Amongst these are an increased risk to infections, gestational diabetes, labor issues and premature birth. Losing weight in the first and last trimester is normal as long as the weight loss is not drastic. Here are a few simple tips to help manage weight during pregnancy effectively. 1. Eat frequent, small meals: Pregnant women are often advised to eat for two. Instead of piling food onto a plate three times a day, break your meals down into smaller bites at more frequent intervals. Eating every two hours is a healthy habit to inculcate. Along with helping maintain portion sizes, this also makes digestion more comfortable. 2. Avoid empty calories: When faced with a choice between fruits and chips, choose the former. Pregnancy cravings are normal but eating a tub of ice cream does not give your body or your baby any nutrition and only lead to unnecessary weight gain. Avoid anything with added sugar and solid fat like soft drinks, fried food, cheese and desserts. These can easily be replaced by fresh juices, nuts, yogurt and fruit sorbets. Also try avoiding caffeine. 3. Drink plenty of water: Apart from preventing dehydration, drinking water also helps in weight maintenance. Filling your stomach with water reduces hunger and thus leads to lesser snacking. Water is also known to increase metabolism. 4. Exercise: Regulating your food intake is only one half of weight maintenance. The second half is regular exercise. Consult your doctor to create a workout regime suited to you. If you were a regular gym enthusiast before pregnancy, there should be no reason to stop now but if you lead a sedentary life before pregnancy don't try and start an intensive gym routine. Light yoga, walking, swimming and cycling are great exercise options for pregnant women. 5. Take your prenatal vitamins regularly: Prenatal vitamins are an essential source of the extra nutrition your body needs during pregnancy. While this can in no way replace meals, it should never be missed out. Prenatal vitamins also help maintain weight by giving your body the nutrition it needs without the accompanied calorie and thus can also help maintain pregnancy weight. The key to maintaining weight during pregnancy is to know your body's requirements and address them properly. For this reason, it is very important to consult a doctor or a dietitian to help understand your calorie needs.